The below FAQ is for Leapster2 units only. If you have the Classic Leapster System please Click Here. 2) Hold down the Hint (?) button while turning the unit on. 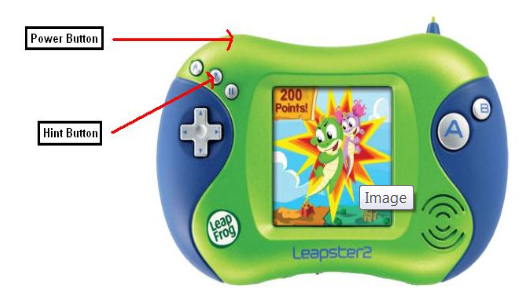 Continue to hold the Hint button down until the LEAPSTER2 menu appears. Remember that you need to hold the "Hint" button down the whole time while you are pressing the power button, and releasing it. 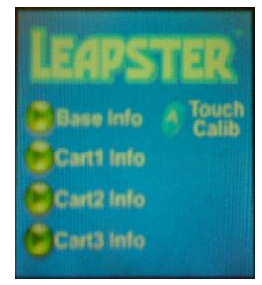 3) The LEAPSTER2 menu will show the options Base Info, Cart1 Info, Cart2 Info, Cart3 Info, and Touch Calib. If you do not see this menu after powering on the Leapster2, turn the Leapster2 off and repeat steps 1 & 2 until you see the menu. 4) When the LEAPSTER2 menu screen appears, press the A button on your handheld.